Iconic actress Angela Lansbury sits down with Momtastic to talk about Mr. Popper's Penguins. In theaters June 17! The summer movie season’s first live-action family comedy event stars Jim Carrey, whose chilly relationship with his family heats up after he inherits six adorable, lovable and mischievous penguins. Mr. Popper’s Penguins is based on the award winning classic children’s book. Momtastic had the pleasure of talking with cast members Angela Lansbury, Carla Gugino, and Jim Carrey in L.A. last week. 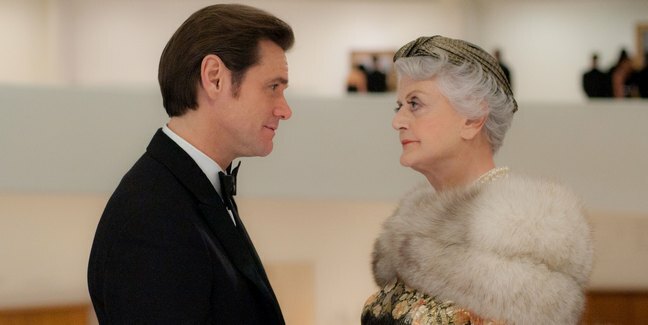 Angela Lansbury plays the role of Mrs. Van Gundy, owner of the famous Tavern on the Green. Here are some highlights from our interview with her! I think she's a hero. I think she's got all the right stuff. She's a tough old bird, but nevertheless she gives him [Mr. Popper] his due when the time comes. She just demands certain levels of behavior. I thought she was kind of wonderful, because of the fact that she obviously had never, never left the 1950s, and that was her time. But, she was a very worthwhile woman, certainly capable of doing all of the things that rich widows do in New York City – involved with charities and that kind of thing. And she was a good soul. She didn't have an ax to grind. She was trying to preserve something that she believed in because it came from her family, from her grandfather and so on, and she was very proud of the fact. And I could believe that. I could play that. Well, I would say that when I was growing up, this was in the 1940s, it was wartime, you know? So, the women who really kind of grabbed me as a young kid, as a student, were women like Katharine Hepburn and certainly Bette Davis and Jean Arthur. Jean Arthur was very unique. I just loved her. He's all business. He really is. He's totally immersed in what he's doing. And he's very thoughtful, very considerate, and works with you. Working with Jim was a tremendous lure for me, because I love working with great artists and he is one of those. He's very special. Well, they weren't there [the real penguins in her scene]. You do know that. They weren't there. So, we were just pretending that they were there, because that was at the Guggenheim Museum with priceless art all over the walls, and although it had all been pushed aside, you understand. But, that whole thing where the water comes whooshing down, it was a wonderful special effect because certainly that wasn't the way it was. I don't know how they did that. That was the miracle of special effects. I'm afraid it is. It is a short lived career. And I've said recently that's one of the reasons that I haven't really gone back into movies, because there weren't any roles. There weren't any roles that I would really want to play. This role, yes, I can play this because she's a character and that's good. I kind of specialize in those kind of weirdoes, you know? And I don't want to say that because, you know, I'm really not that way at all. I’m more like Jessica [Fletcher], really. So, it's not easy. There's this movie out called Beginners. Have you been reading about it? What is that great actor who's in that who plays a man in his 70s who's dying who comes out, right? Christopher Plummer. What a great role, and he's a man. You know, he and I are about the same age. And he gets to play that part, you know? There aren't many women who'd get to play that kind of role. Not just because he comes out. I'm not talking about that. I don't want to play a woman who comes out necessarily, although that would be interesting. Nevertheless I think it's great. I don't think so. I tend to kind of shut the door on roles. There's been such an enormous variety if you think about the work that I've done in film. Nothing that I've ever done in film has been enough for me to show what is really there. It's always been fragmented, in a curious way. I've never had the opportunity to play a role which began and then went to a middle and then culminated in the end. And I've never done that. I don't know who has, but I've always felt there was something that I wished I could have acted that I've never had a chance. It's always been a kind of quirk or this or something like that. Well, on the one hand, it has been a blessing because it made me known worldwide. I have to say that, even though the role of Jessica Fletcher was one, you could say, that one almost walked through. I say that with love and appreciation of the character that was given to me to play, but it did not require any great artistry to play Jessica Fletcher. But, I loved her because she was such a straight on woman with charm and with a good brain and a wonderful liberal outlook on life. And I just felt that she represented women in the best possible way. And that intrigued me. And I think that was the reason the character was such a successful person in television, even though she wasn't a pop heroine by any manner of means. She wasn't Mary Tyler Moore. She was Jessica, and that's okay. She's still out there all over the world. If you're looking for something to do this weekend for Father's Day, I highly recommend checking out the movie – the whole family will enjoy it!! "Bring your Pop to Poppers"! Enter our giveaway for your chance to win a $100 movie gift card and a copy of the book!